Submitted by reader Dan Lennard. Additional thanks to Joseph Reynolds. The fans loved both guys. KUSHIDA won by submission with the Hoverboard Lock. They essentially had a squash match, with Nagata beating him with a backdrop hold. There was nothing wrong with this, but it was too short. This was the only match where the fans were solidly behind the locals, though there were plenty of Los Ingobernables de Japon fans in the crowd. EVIL got the pin on Eagles in a very fast-paced bout. The best match of the night up to this point. The Bullet Club was super over, especially Omega. Everyone hit their big moves and all the Aussies got in some great offense, including an interesting spot where Slex got heat on Omega. In the end, Omega hit the One Winged Angel on Slater for the finish. Omega spoke to the crowd after, mentioning that it's funny they're booed in Japan but cheered in Sydney. He thanked everyone and pointed out that Fale helped put the tour together. Everyone was into everything Suzuki did. He was probably the third most over wrestler of the night (behind Okada and Omega), with the fans singing along to his theme music before and after the show. The match was fun and ended when Suzuki hit Henare with a Gotch-style piledriver. Suzuki beat the heck out of Henare for most of the bout. The crowd also loved Suzuki when he did a brief post-match promo. This match started slow -- there were mostly NJPW fans in the crowd and they clearly didn’t know many of the Australian wrestlers. Despite that, this got a big reaction by the end. Ishii gave Gambino a lot and it was very back and forth. The ending seemed slightly botched as Ishii appeared to deadlift Gambino for a brainbuster. Ishii then stormed to the back, but maybe that’s how he is all the time. The crowd hated Cody, and he played up being the bad guy throughout the match. There was a lot of comedy in the opening minutes, but it soon turned into a sensational bout and was probably the match of the night. The MVP for the show had to be Ospreay, who was on fire. Everyone was great, though. The ending came when Okada hit Matt Jackson with a Rainmaker for the pin. Everyone in Chaos spoke following the match. White got booed mercilessly when he accidentally called us Melbourne fans instead of Sydney fans. Ospreay was rolling on the mat laughing -- even Okada mocked him when he had the microphone. 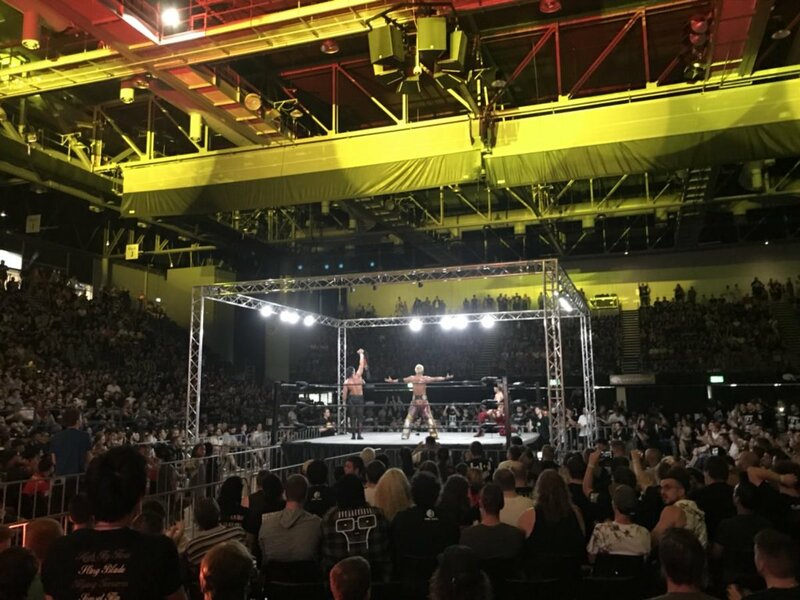 Okada also said NJPW will definitely be coming back to Australia for another tour. All in all, this show was sensational from top to bottom. Every match was good, and a couple were great. Lines for all merchandise, particularly Bullet Club and Young Bucks merch, was insane.